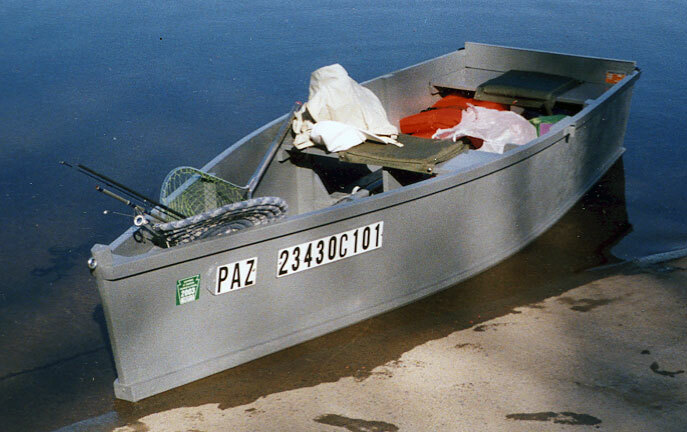 This boat was designed and built by Robert Wallace between October 2001 and May 2002. He launched her in May on White Oak Pond in northeastern Pennsylvania. The skiff has a 10' LOA and maximum beam of 39". She is a semi-V hull. Bob writes "It is rather unimpressive looking, but for my first time, I'm pleased. It didn't leak a drop since its launch. It maneuvers easily in the water. I'm catching fish! Your magazine and web site were a tremendous help." Contact Robert at send-it@att.net.